Here we are the 2nd post for the Dear Applicant Mini Series discussing the joys of interviewing. I’ve given a lot of interviews in my years, more of them have been given as an assistant manager than as an HR pro. I’ve learned a lot about people by conducting those interviews and figuring out how to do that has not come easy. For example, trying the Stabler and Benson approach to get an interviewee, to tell the truth, yeah, it’s not good for business. Tell me about yourself? – I love this question, it’s my favorite of all, and I’m going to ask it at every interview. I want interviewees to tell me about who they are as a person, not that they “work hard”. I’m sure that is going to come up at some point, but tell me you like skiing or race car driving. Anything that’s not the norm and that will get a conversation going. Interviews are no longer 2 people staring at each other just asking hypothetical questions. Be careful not to overshare, but don’t just make it the response we hear every day, stand out from the crowd. Why did you leave your last job? – Please do not spend this time bashing the company that you previously worked for, it makes me think this is exactly what you will do when you’re tired of this position. Instead, tell me why you’re looking to advance in your career, that the growth you were ready to pursue was not available at that position. Why do you want to work for us? – I hope you’ve researched the company before the interview if you have the chance. I was hired for my HR position through a temp agency and had no idea the company I was interviewing for. When I was face to face with the VP of HR, my current boss, I had to use the big company as help to answer this question. Instead of being specific to this franchise, I told her the company was the best in its industry and I wanted to be associated with a company that believes in its product and its people. 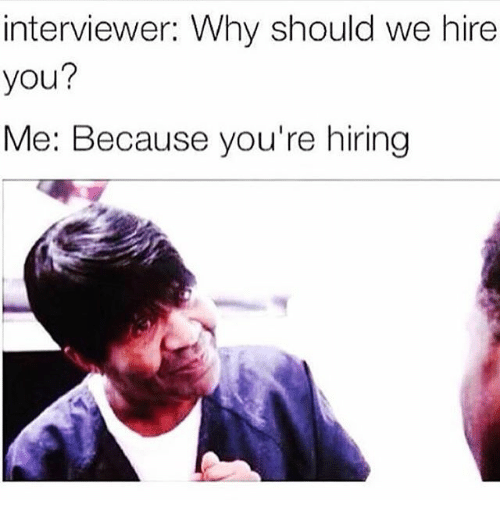 Why should we hire you? – Although the meme below is very fun, this is not a good answer. Tell me what you’re going to bring to the company and how you’re going to help us expand. What benefit will we receive from adding you to our team? These are just a few suggestions that I like to give people preparing for an interview. It’s not perfect, a matter of fact, some HR pros will tell you my answer to #1 question is exactly what they don’t want to hear. However, feel out the room and the individuals, be ready to have a conversation, not just answer questions. Another tip is to have a few questions lined up for the company. Simply asking about the team or culture in the workplace or what exactly they will be expecting you to be as a team member. What questions or tips do you have for interviews? Comment them below! Next Post Dear Applicant 3 – Let’s Talk Callbacks!